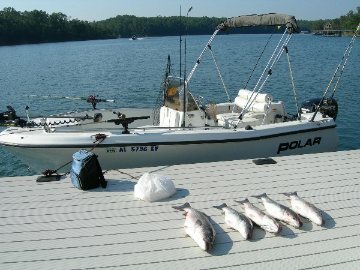 �We�fish out of�a 20 ft. Playtime�center console�boat with an Evenrude motor. Lowrance�X-27c with�7"�screen, equipped with GPS. Minn Kota trolling motor with hand held remote. The reels that we use are Okuma, Penn, and Abu Garcia all with bait clickers. We use Berkely Big Game rods with 20lb. test Berkely Big Game line. Our leaders are tied with 20lb. test Seaguar. The bait we use are live Gizzard Shad for the majority of our fishing. We catch them ourselves on the Warrior River. We can also keep them alive and healthy for a long period of time, with the right addatives. The size bait we use depends on the season. Spring and Summer seems to be the time when they like to eat the bigger Gizzard Shad. Winter, they like the smaller Gizzard Shad. We always are casting artificial baits, anything from big swimbaits to red fins on top and sometimes bucktail jigs. This is our shad keeping facilities. 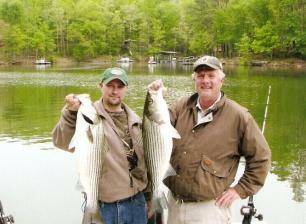 We are able to accomidate 900-1000 shad. We are able to keep the shad alive with this system for up to three months if needed.